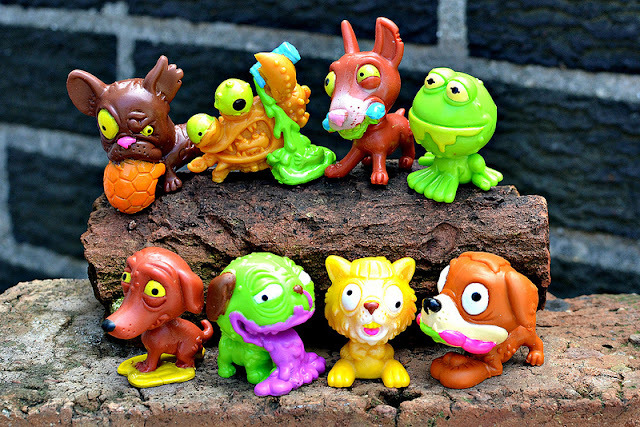 The Trash Pack and Mutant Mania might be gone from store shelves, but Moose Toys has new line of little weirdos out to help fill the void. 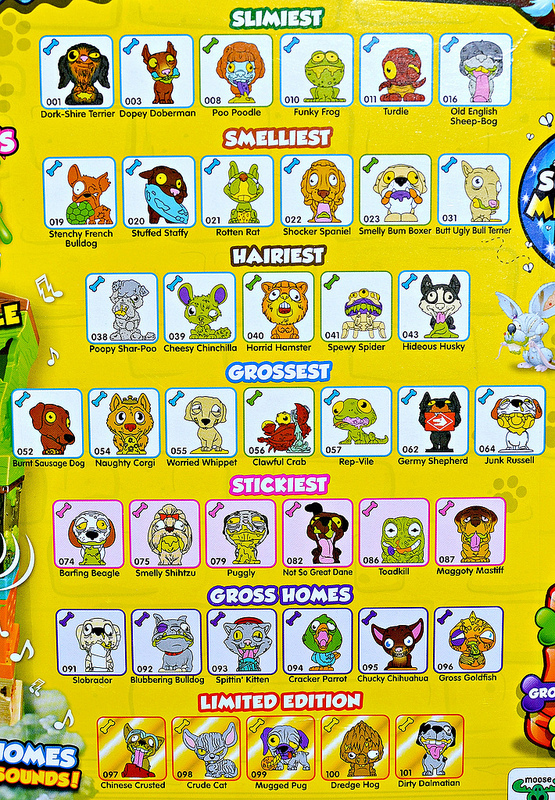 This time the theme is pet animals, but once again Moose has added "a gross out" element, so we've got puke, sludge, poop and all that kind of stuff. 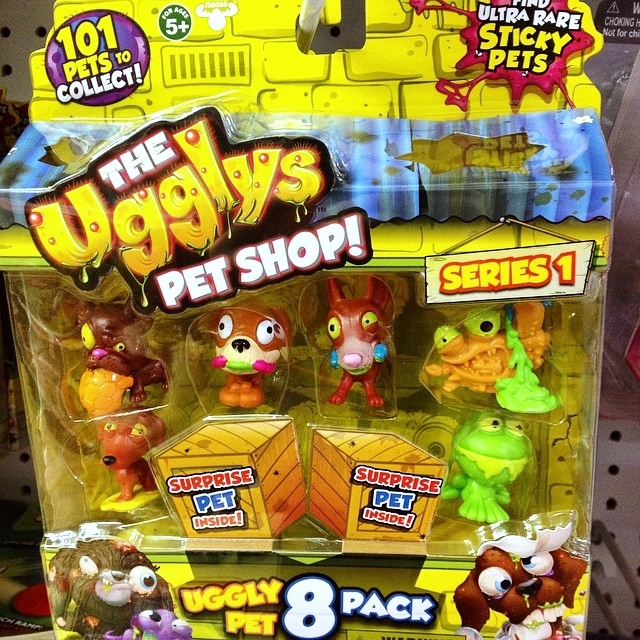 Meet the crazy critters of The Ugglys Pet Shop! When I first saw photos of these, I didn't plan on buying any. They didn't seem to bring anything new that The Trash Pack didn't already offer over many series. But when I actually saw them up close in Toys R Us, I had to pick up a pack. It didn't hurt that I found a package with both a monstrous-looking crab and a weirdo frog, both of which I found hard to resist. The figures are sold in eight-packs (with six figures visible and two hidden) as well as blind two-packs that come in little cans. The eight-packs cost $9.99 at Toys R. Us, and I believe the two-packs were $2.99. Other products are also available, such as little "houses" for the animals that make sounds, a "Dirty Dog Wash Van" and a Pet Store. There are 41 different sculpts, but each figure comes in a few color variations so when you factor those in, there's a lot of Ugglys to collect. 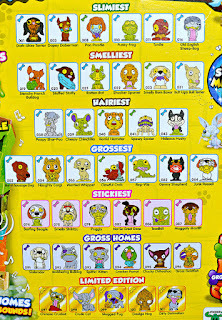 The characters are categorized in seven groups: Slimiest, Smelliest, Hairiest, Grossest, Stickiest, Gross Homes, and Limited Edition "Rusty Pets." 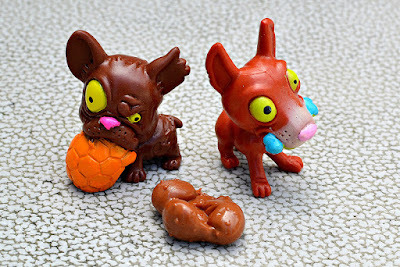 Each package comes with a blind-bagged little hunk of "surprise poop," which come in various sculpts and colors (brown, green and even metallic colors). I think this little addition automatically gives the line the biggest gross-out factor of any Moose series so far. As with The Trash Pack and Mutant Mania, the figures have different levels of rarity in order to add a chase element to the line. The figures are around 1 to 1.5 inches tall and are made out of a soft, flexible rubber that's more like Monster in My Pocket material than the squishy Trash Pack material (I was really pleasantly surprised by this--I was actually expecting a firmer plastic just by looking at the figures). 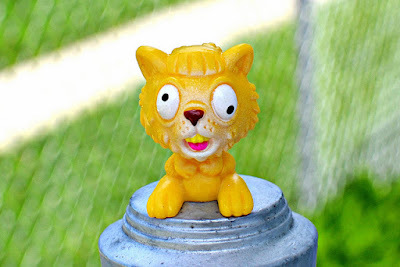 The Ultra Rare figures are made out of a sticky rubber, which I wish Moose wouldn't have done (enough with the sticky toys already--they're just fuzz and dirt collectors). Now let's see a few of the Ugglys up close. Here are two of the many doggies in the line. We've got Stenchy French Bulldog on the left and Dopey Doberman on the right. Oh, and a turd right there in the middle. I was hoping to find a golden turd, but instead got a plain ol' brown one. What can you do. While dogs make up the bulk of the figures in Ugglys Pet Shop, my favorites are actually the other animals. 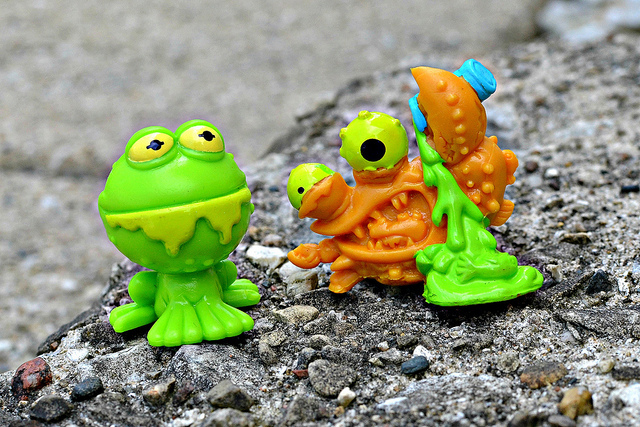 Like these two, the aforementioned Funky Frog and Clawful Crab. I love how the frog looks like a sickly version of Kermit, and that gnarly crab sculpt is just awesome. I also pulled this little guy, the Horrid Hamster. It was one of the hidden figures in my pack. I actually had no idea he was supposed to be a hamster until I looked him up on the pamphlet. He's definitely one of my favorites, though. I dig how loopy and dazed he looks. And there you go--my first trip to The Ugglys Pet Shop. I'm not yet sure whether I'll be collecting more figures from the line, but I'm definitely glad I bought a pack. Some of the sculpts are really fun, and the material that Moose used really adds to the appeal. What about you? Have you picked up any Ugglys Pet Shop toys yet? What do you think? I bought a bunch of Crashlings when series 1 was released -- they were fun, but lacking a certain X factor. Not sure if series 2 ever came out! The Ugglys don't grab me so much at this stage but we'll see how we go. Yeah, most of the Crashling were too cutesy looking for my taste, and the Ugglys also weren't grabbing me much from photos. But having some in hand, I like them more than I thought I would. I think some of the sculpts are too similar but there's some great ones too.